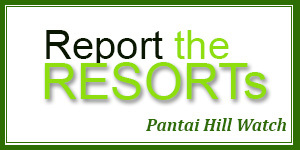 The Pantai Hill Watch group was founded in 2015 by concerned residents of the hill. We are a group of people who care deeply about the unique gift of Pantai Hill. We are grateful for the opportunity to live at the edge of the Berumbun forest reserve, offering – pristine waterfalls, streams, wildlife, matured trees, immense beauty, tranquility and peace. Our aim is not to divide residents and owners, but unite all and keep this treasured place pristine.